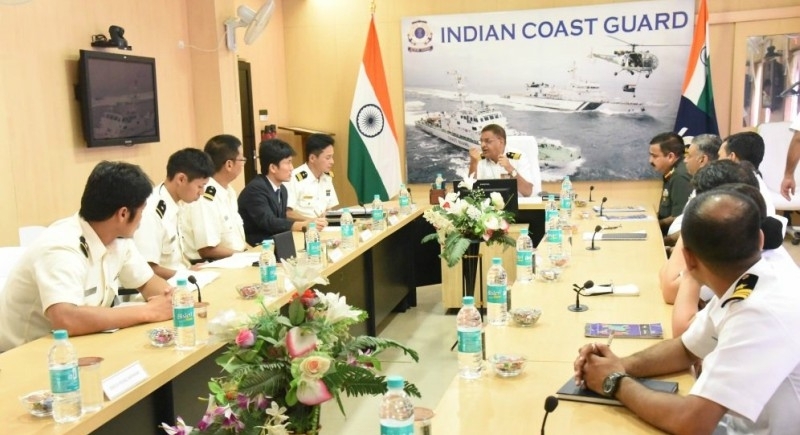 New Delhi, September 11: Aiming to strengthen ties between the Coast Guards of two maritime countries for better coordination, and joint operations in future, an eight-member Japanese Coast Guard delegation on Monday visited the Coast Guard Regional. The Coast Guard Region (West) briefed the delegation on coastal security mechanism and their preparedness to tackle maritime emergencies arising especially during monsoon, such as marine oil pollution, grounding of the ship, cyclones, measures taken by the Coast Guard to safeguard the interests of the fishing community, etc. The delegation was led by Coast Guard Superintendent (3rd Grade) Shinsuke Hayama, Commanding Officer, 30th Somalia Dispatch Investigation team. Second Secretary from Embassy of Japan, Takashi Yamashita, was also present. The official Twitter handle of the Indian Coast Guard tweeted, "A Japanese Coast Guard delegation led by Supt Katsuhiko Sugiyama, Commanding Officer, Somalia Dispatch Investigation Team, Piracy Countermeasure Office, Japan visited Maritime Rescue Coordination Centre(MRCC)/Remote Operation Centre(ROC) @IndiaCoastGuard Mumbai @DefenceMinIndia." There has been a regular presence of the Japan Coast Guard in the Bay of Bengal since 2000, for the regular joint exercise, Sahyog-Kaijin. It now includes Sri Lanka and Maldives as observers. A Joint India-Japan Coast Guard exercise was held in January this year at Chennai where the Japan Coast Guard ship Tsugaru participated. Observers from 17 countries, a delegation from the Coast Guard of Japan, and members of the National Maritime Search and Rescue Board also witnessed the drill.